For the boxer, see Matthew Barney (boxer). Matthew Barney was born March 25, 1967, as the younger of two children in San Francisco, California, where he lived until he was 7. He lived in Boise, Idaho from 1973 to 1985, where his father got a job administering a catering service at Boise State University and where he attended elementary, middle, and high school. His parents divorced and his mother, an abstract painter, moved to New York City, where he would frequently visit. It was there where he was first introduced to the art scene. Barney was recruited by Yale University in 1985 to play football and planned to go into pre-med, but he also intended to study art. In 1989, he graduated from Yale. His earliest works, created at Yale, were staged at the university’s Payne Whitney Gymnasium. In the 1990s Barney moved to New York, where he worked as a catalog model, a career that helped him finance his early work as an artist. In 2002, Barney had a daughter with his then partner, the singer Björk, with whom he lived in a penthouse co-op in Brooklyn Heights. By September 2013, Barney and Björk were no longer a couple; Björk chronicled the breakup in her 2015 album Vulnicura. As of 2014, Barney maintained a studio in Long Island City, Queens. The ongoing[when?] Drawing Restraint series began in 1987 as a series of studio experiments, drawing upon an athletic model of development in which growth occurs only through restraint: the muscle encounters resistance, becomes engorged and is broken down, and in healing becomes stronger. In literally restraining the body while attempting to make a drawing, Drawing Restraint 1–6 (1987–89) were documentations made using video and photography. Drawing Restraint 7 marks the influx of narrative and characterization, resulting in a three channel video and a series of drawings and photographs, for which Barney was awarded the Aperto Prize in the 1993 Venice Biennale. A series of ten vitrines containing drawings, Drawing Restraint 8 was included in the 2003 Venice Biennale and prefigured the narrative development for Drawing Restraint 9 (2005). A major project consisting of a feature-length film and soundtrack composed by Björk, large-scale sculptures, photographs and drawings, Drawing Restraint 9 was built upon themes such as the Shinto religion, the tea ceremony, the history of whaling, and the supplantation of blubber with refined petroleum for oil. A full-scale survey of Barney's work through Drawing Restraint 9 was held at the San Francisco Museum of Modern Art in 2006 and included over 150 objects of varying media. Drawing Restraint 10 – 16 (2005–07) are site-specific performances that recall the earlier Yale pieces. Drawing Restraint 17 and 18 were performed at the Schaulager in Basel in 2010 in conjunction with the exhibition "Prayer Sheet with the Wound and the Nail," a survey of the Drawing Restraint series through Drawing Restraint 18. Drawing Restraint 19 employs a skateboard as a drawing tool. A block of graphite is mounted beneath the skateboard deck on the front end of the board. A skater performs a nose manual (a wheelie on the nose of the board, leaning in the direction of movement) across a smooth surface, tipping the nose of the board forward and leaving behind a drawn graphite line. The piece was part of a benefit art show and auction titled "Good Wood", raising awareness and funds for Power House Productions' Ride It Sculpture Park in Detroit, Michigan. The riding was performed on site by skateboarder Lance Mountain, documented by photographer Joe Brook and published by Juxtapoz Magazine in their February 2013 issue. The board was purchased by People Skate and Snowboard and it is displayed at their only location in Keego Harbor, Michigan. Barney's epic The Cremaster Cycle (1994–2002) is a project consisting of five feature-length films that explore processes of creation. His concentration in sculpture is accentuated by his use of video. Barney uses video to perfect his sculpture by evaluating positioning, lighting, size and shape, using video as a means to his end product of sculpture. Barney’s long-time collaborator Jonathan Bepler composed and arranged the films’ soundtracks. The cycle unfolds not just cinematically, but also through the photographs, drawings, sculptures, and installations the artist produces in conjunction with each episode. Its conceptual departure point is the male cremaster muscle, which controls testicular contractions in response to external stimuli. The project is rife with anatomical allusions to the position of the reproductive organs during the embryonic process of sexual differentiation: Cremaster 1 represents the most "ascended" or undifferentiated state, Cremaster 5 the most "descended" or differentiated. The cycle repeatedly returns to those moments during early sexual development in which the outcome of the process is still unknown. In Barney's metaphoric universe, these moments represent a condition of pure potentiality. As the cycle evolved over eight years, Barney looked beyond biology as a way to explore the creation of form, employing narrative models from other realms, such as biography, mythology, and geology. The photographs, drawings, and sculptures radiate outward from the narrative core of each film installment. Barney's photographs—framed in plastic and often arranged in diptychs and triptychs that distill moments from the plot—often emulate classical portraiture. His graphite and petroleum jelly drawings represent key aspects of the project's conceptual framework. The Walker Art Center is the only American institution to own the entire Cremaster Cycle. River of Fundament takes the form of a three-act opera and is loosely based on Norman Mailer’s novel Ancient Evenings. In collaboration with composer Jonathan Bepler, Barney combines traditional modes of narrative cinema with filmed elements of performance, sculpture, and opera, reconstructing Mailer’s hypersexual story of Egyptian gods and the seven stages of reincarnation, alongside the rise and fall of the American car industry. Barney replaced the human body with the body of the 1967 Chrysler Imperial that was the central motif from his earlier film Cremaster 3. The film’s central scene is an abstraction of Mailer’s wake, set in a replica of the late author’s apartment in Brooklyn Heights and featuring Maggie Gyllenhaal, Paul Giamatti, Elaine Stritch, Ellen Burstyn, Peter Donald Badalamenti II, Joan La Barbara, and jazz percussionist Milford Graves. Barney began producing a new two-hour film, book, and major exhibition for the Yale University Art Gallery, Redoubt, in 2017, which premiered in March 2019. It is set in the Sawtooth Range of Idaho, United States, and uses multiple layers of myths, including the myth of Diana and Actaeon, as well as references to the controversial reintroduction of wolves into the Sawtooth Mountains and metallurgy, to discuss "humanity's place in the natural world". Barney has explored live performance before an audience. The pieces REN and Guardian of the Veil revisit the language of the Cremaster Cycle, via a ritualistic exploration of Egyptian symbolism inspired by Norman Mailer's novel Ancient Evenings. Guardian of the Veil took place on July 12, 2007 at the Manchester International Festival in England. REN took place on May 18, 2008 in Los Angeles. His most recent[when?] performance, KHU, the second part in his seven-part performance series in collaboration with Jonathan Bepler inspired by Ancient Evenings took place on October 2, 2010 in Detroit. In June 2009, a collaboration between Barney and Elizabeth Peyton, entitled Blood of Two, was performed for the opening of the Deste Foundation's exhibition space, the Slaughterhouse, located on the Greek island Hydra. The two-hour performance involved divers retrieving from a nearby cove a vitrine containing drawings which had been submerged for months. A funeral-like procession of fishermen carried the case up a winding set of stairs. At one point, a dead shark was laid on the case, and the fishermen proceeded to the gallery space, carrying the case and shark, accompanied by the onlookers and a herd of goats. At the Slaughterhouse, the case was opened, water poured out, and the drawings revealed. The shark was eventually cooked and fed to the guests. Following his inclusion in various group shows at Althea Viafora gallery in New York in 1990, Barney's solo debut in 1991 at the Barbara Gladstone Gallery was hailed by The New York Times as "an extraordinary first show". That same year, at the age of twenty-four, he was honored with a solo exhibition at the San Francisco Museum of Modern Art. The Museum Boijmans Van Beuningen, Rotterdam, organized a solo exhibition of his work that toured Europe throughout 1995 and 1996. Barney was subsequently included in many international exhibitions, such as documenta 9 in Kassel (1992); the 1993 and 1995 Biennial exhibitions at the Whitney Museum of American Art, New York; and Aperto ’93 at the 48th Venice Biennale, for which he was awarded the Europa 2000 Prize. For the season 2000/2001 in the Vienna State Opera Matthew Barney designed a large scale picture (176 sqm) as part of the exhibition series "Safety Curtain", conceived by museum in progress. "Matthew Barney: The Cremaster Cycle", an exhibition of artwork from the entire cycle organized by the Solomon R. Guggenheim Museum, premiered at the Museum Ludwig, Cologne, in June 2002 and subsequently traveled to the Musée d'Art Moderne de la Ville de Paris and the Guggenheim Museum in New York. A large-scale exhibition of the entire “Drawing Restraint” series was organized by the 21st Century Museum for Contemporary Art, Kanazawa, in 2005 and traveled to Leeum, Samsung Museum of Art, Seoul; San Francisco Museum of Modern Art; Serpentine Gallery, London; and Kunsthalle Wien, Vienna. Barney has also had major solo exhibitions organized by Astrup Fearnley Museum of Modern Art in Oslo (2003), Living Art Museum in Reykjavik (2003), Sammlung Goetz in Munich (2007), and Fondazione Merz in Turin (2008). His work has been included in major group exhibitions including "Moving Pictures" at Solomon R. Guggenheim Museum in New York and Guggenheim Bilbao (2002), Venice Biennale (2003), "Quartet: Barney, Gober, Levine, Walker" at Walker Art Center in Minneapolis (2005), Biennial of Moving Images at Centre pour l’Image Contemporaine in Paris (2005), and "All in the Present Must Be Transformed: Matthew Barney and Joseph Beuys" at Deutsche Guggenheim in Berlin (2006). In 2013, the Morgan Library & Museum mounted “Subliming Vessel: The Drawings of Matthew Barney”, the first museum retrospective devoted to the artist’s drawings, later traveling to the Bibliothèque Nationale de France in Paris. In 2015, Barney exhibited "Matthew Barney: River of Fundament" at the Museum of Contemporary Art, Los Angeles, his largest filmic project since the Cremaster Cycle and first major museum solo exhibition in Los Angeles. Rather than reading Cremaster, we are encouraged to consume it as high-end eye candy, whose symbolic system is available to us but hardly necessary to our pleasure: meaning, that is, is no longer a necessary component to art production or reception. Left to its own devices-and it is all devices, Cremaster places us in a framework of mutually assured consumption, consuming us as we consume it. The philosopher Arthur C. Danto, well known for his work on aesthetics, has praised Barney's work, noting the importance of Barney's use of sign systems such as Masonic mythology. Others have asserted Barney's works are contemporary expressions of surrealism. In the words of Chris Chang, Barney's Cremaster films, though "completely arcane, hermetic and solipsistic ... nevertheless periodically provide some of the most enigmatically beautiful experimental film imagery you'll ever see." "Is Barney's work a new beginning for a new century? ", asks Richard Lacayo, writing in Time. "It feels more like a very energetic longing for a beginning, in which all kinds of imagery have been put to the service of one man's intricate fantasy of return to the womb. Something lovely and exasperating is forever in formation there. Will he ever give birth?" Barney's work for the 2007 Manchester International Festival received mixed reviews. "Barney is the real thing. When he brings his boundless imagination to a subject he goes down to its depths to create images and implant ideas that stay in your mind for ever" writes art historian Richard Dorment in The Daily Telegraph. Kanye West also admires Barney's work and credited him as an influence on the music video for West's song "Famous". Hugo Boss Prize, Guggenheim Museum, 1996. Kaiser Ring Award Museum für moderne Kunst, Goslar, Germany, 2007. Kirk, Kara. Matthew Barney: New Work. San Francisco Museum of Modern Art, San Francisco, 1991. ISBN 0-918471-23-0. Wakefield, Neville, and Richard Flood. Pace Car for the Hubris Pill. Museum Boijmans Van Beuningen, Rotterdam, 1995. ISBN 90-6918-148-7. Barney, Matthew. Cremaster 4. Foundation Cartier, Paris and Barbara Gladstone Gallery, New York, 1995. ISBN 978-2-86925-051-2. Kertess, Klaus. Matthew Barney: Drawing Restraint Volume 7. Cantz Verlag, Ostfildern, Germany, 1996. ISBN 978-3893227921. Barney, Matthew. Cremaster 1. Kunsthalle Wien, Museum für Gegenwartskunst Basel, Basel, 1997. ISBN 3-85247-013-7. Barney, Matthew. Cremaster 5. Portikus, Frankfurt, and Barbara Gladstone Gallery, New York, 1997. ISBN 978-1-881616-87-0. Flood, Richard, and Matthew Barney. Cremaster 2. Walker Art Center, Minneapolis, 1999. ISBN 978-0-935640-64-9. Barney, Matthew. Cremaster 3. Guggenheim Museum, New York, Distributed Art Publishers, Inc., 2002. ISBN 0-89207-253-9. Barney, Matthew. Matthew Barney/The Cremaster Cycle. Meeting House Square, Temple Bar, Dublin, 2002. Spector, Nancy, and Neville Wakefield. Matthew Barney: The Cremaster Cycle. Guggenheim Museum Publications and Harry N. Abrams, Inc., New York, 2002. ISBN 0-8109-6935-1. Kvaran, Gunnar B., and Nancy Spector. Matthew Barney: The Cremaster Cycle. Astrup Fearnley Museet for Moderne Kunst, Oslo, 2003. ISBN 978-8291430379. McKee, Francis, Hans Ulrich Obrist, and Matthew Barney. Drawing Restraint Volume 1. Walther König, Cologne, 2005. ISBN 0-9795077-0-7. Hasegawa, Itsuko, and Shinichi Nakagawa. Drawing Restraint Volume 2. Uplink Co., Tokyo, 2005. ISBN 4-900728-14-4. Barney, Matthew. Drawing Restraint Volume 3. Leeum Samsung Museum of Art, Seoul, 2005. ISBN 89-85468-34-0. Barney, Matthew. Drawing Restraint Volume 4. JMc & GHB Editions, New York and Sammlung-Goetz, Munich, 2007. ISBN 978-0-9795077-0-0. Wakefield, Neville. Drawing Restraint Volume 5. Walther König, Cologne, 2007. ISBN 978-3-86560-318-0. Barney, Matthew. Matthew Barney. Mönchehaus Museum für Moderne Kunst, Goslar, Germany, 2007. Barney, Matthew, Karsten Löckemann, and Stephan Urbaschek. Matthew Barney. Kunstverlag Ingvild Goetz, Munich, 2007. ISBN 978-3-939894-09-4. Barney, Matthew, and Olga Gambari. Matthew Barney: mitologie contemporanee. Fondazione Merz, Turin, 2009. ISBN 978-88-7757-235-6. Barney, Matthew. Drawing Restraint Volume 6. Schaulager/Laurenz Foundation, Basel, 2010. Barney, Matthew. Matthew Barney: KHU Playbill. Barney Studio, New York, 2010. Barney, Matthew. Matthew Barney: DJED Playbill, Gladstone Gallery, New York, 2011. ^ Pareles, Jon (30 January 2015). "Sometimes Heartbreak Takes a Hostage". The New York Times. The New York Times Company. Retrieved 25 March 2015. ^ Jonathan Jones, The myth-maker, The Guardian, 16 October 2002. ^ "Matthew Barney". AllMusic.com. Retrieved April 2, 2015. ^ a b c Kristine McKenna (November 20, 1994), This Boise Life, or Hut Hut Houdini Los Angeles Times. ^ a b c Michael Kimmelman (October 10, 1998), The Importance of Matthew Barney New York Times Magazine. ^ Matthew Barney Biography. Cremasterfanatic.com. Retrieved on 2011-02-28. ^ Searle, Adrian (16 June 2014). "Matthew Barney: 'My work is not for everyone'" – via The Guardian. ^ Pareles, Jon (22 January 2015). "A Heart Broken and Dissected Björk's 'Vulnicura,' From Deep Within". New York Times. New York. Retrieved 22 January 2015. ^ Adrian Searle (June 16, 2014), Matthew Barney: 'My work is not for everyone' The Guardian. ^ Matthew Barney: Drawing Restraint Archived 2010-07-28 at the Wayback Machine at SFMOMA. ^ "Matthew Barney: Prayer Sheet with the Wound and the Nail". Schaulager.org. 2010-10-03. Retrieved 2013-06-07. ^ "Lance Mountain x Matthew Barney in Detroit. Juxtapoz Magazine. January 8, 2013". ^ "Matthew Barney's graphite skateboard". Phaidon club. Retrieved 2013-01-15. ^ The Body as Matrix: Matthew Barney's Cremaster Cycle. Perf. Matthew Barney. DVD. Films Media Group Co., 2004. ^ "jonathanbepler.com". jonathanbepler.com. Retrieved 2013-06-07. ^ Quartet: Barney, Gober, Levine, Walker, April 17, 2005 – November 5, 2006 Walker Art Center, Minneapolis. ^ a b c Matthew Barney: Ancient Evenings: Libretto, March 20 - May 9, 2009 Gladstone Gallery, Brussels. ^ "Who wants to join the cult of video artist Matthew Barney?". The Washington Post. Retrieved March 22, 2019. ^ "Matthew Barney: Redoubt | Yale University Art Gallery". Yale University Art Gallery. Retrieved March 21, 2019. ^ "Matthew Barney's Heart of Darkness". The Brooklyn Rail. ^ Item idem, "Now Viewing | ‘Blood of Two’" The Moment June 17, 2009 nytimes.com Retrieved on July 13, 2009. ^ a b Matthew Barney Solomon R. Guggenheim Museum, New York. ^ "Safety Curtain 2000/2001", museum in progress, Vienna. ^ Carol Vogel (February 28, 2013), Matthew Barney Heads to the Morgan Library New York Times. ^ "Matthew Barney: River of Fundament". ^ Martinez, Alanna (June 28, 2016). "In Other News, Kanye West Names Matthew Barney His Personal Jesus". New York Observer. Retrieved January 6, 2017. ^ Helman, Peter (June 25, 2016). "Kanye West Explains His Shocking "Famous" Video: "Matthew Barney Is My Jesus"". Stereogum. Retrieved January 6, 2017. ^ 'Hugo Boss Prize website' Archived 2011-06-15 at the Wayback Machine. Retrieved 31 January 2010. ^ "Matthew Barney The Goslar Kaiser Ring 2007". Moenchehaus.de. 1967-03-25. Archived from the original on 2013-10-19. Retrieved 2013-06-07. ^ "moenchehaus.de". moenchehaus.de. Retrieved 2013-06-07. Ulrich-Obrist, Hans. Interview with Matthew Barney in Drawing Restraint Volume 1. Verlag der Buchhandlung Walther König, Köln, Germany 2005, pp. 87–91. ISBN 0-9795077-0-7. Keller, Alexandra, and Frazer Ward. "Matthew Barney and the Paradox of the Neo-Avant-Garde Blockbuster", Cinema Journal, 45, No. 2, Winter 2006, pp. 3–16. McClure, Michael Jay. "Queered Cinema: Film, Matter, and Matthew Barney." Discourse, Volume 32, Number 2, Spring 2010, pp. 150–169. Barney, Matthew. "Matthew Barney: Drawing Restraint Volume 2," Whitney Biennial 2010 exhibition catalog, Whitney Museum of American Art, Yale University Press, New Haven, 2010. 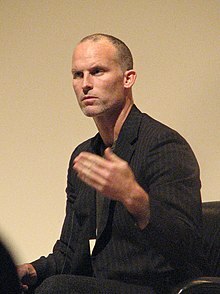 Wikimedia Commons has media related to Matthew Barney.